Second purchase from here and so pleased with the coasters. Placemat sets now available on my shop! - two sizes to choose from!! The personalised stitched copper tiles are very popular at the moment!! Perfect for weddings or anniversaries! 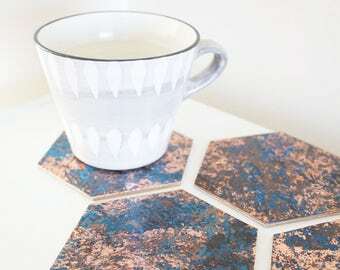 Hexagonal copper coasters now available! All products are handmade in my studio at home, in Bedworth. Since graduating in 2015, I began a full-time job as a Junior Designer, but enjoy spending my spare time continuing my passion for surface manipulation and opened my Etsy shop to sell my unique copper creations!